Flying a German flag, the Yankee-built Athena on 21 April 1862 began one of the most unpleasant voyages in the annals of Mormon migration. This square-rigger sailed from Hamburg with 484 Scandinavian Saints under the leadership of Ola N. Liljenquist, a Swedish master tailor and one-time burgher of Copenhagen. Elder Liljenquist was the first Scandinavian convert to return to his native land as a missionary. A strong spiritual leader, he served two missions in Europe, one as president of the Scandinavian Mission. Later he was ordained a patriarch in the LDS Church and became an early settler in northern Utah. After arriving at Hamburg from Copenhagen, the Saints traveled five miles up the Elbe River to board the Athena. Master and part-owner of the ship was Captain D. Schilling, who early demonstrated a harsh and hostile attitude toward his passengers. To his dismay, Elder Liljenquist soon learned the difference between the German and British laws in providing for emigrants during passage. He recalled, "The water for use on shipboard taken in on the Hamburg Elbe, rotted long before we reached our destination; the provisions were of very inferior kind and the way it was cooked was still worse, and then not half enough of it." "One Sunday afternoon, after we had concluded our afternoon services, I suppose through jealousy and not having any influence with the Saints, he threatened to throw me overboard and I suppose he would have carried out his purpose had he dared to." We had favorable winds for several days, with considerable motion of the sea, and therefore many suffered with sea sickness. Two weeks after leaving Glilckstadt we had covered about half the distance to New York, but from that time the wheel of fortune rather turned against us. While we hitherto had been favored with good winds, these now turned, and then at other times we had a perfect calm. The captain steered towards the southwest until we reached the Gulf Stream, about 300 miles south of the New Foundland Banks. After that we had such a calm for a whole week that not even a feather stirred and the temperature of the water and air varied between 70 and 80 degrees Fahrenheit. This sudden change from the cool north, together with the bad water, which became stagnant from the heat, caused the sickness, which already had a hold among us, to increase rapidly. The measles took away 33 of the little ones, and several of the adults also suffered with bowel complaints and diarrhea. The first winds that blew the captain utilized to take us further north into a cooler climate. Now, we are well, thanks to Him, who holds our destiny in his hands. Five adults have died, namely Ole Nielsen, 37 years old; Christine Poulsen, 29 years old; Hans Nielsen from Amager, 52 years old; Ane Nielsen, 70 years old, and Kaisa Rosen, 65 years; of age. The captain ordered the cook to make oat meal porridge for the sick in the morning, rice at noon, and sago porridge in the afternoon. After a forty-seven-day passage the Athena arrived at New York on 7 June. Thirty-eight passengers had died, one of the highest death tolls of any emigrant company. Many others had taken ill. Two days later the company was on a train headed for Florence, Nebraska. There the Saints encountered a long delay before continuing their westward journey, and several more died. Although built in America, this vessel's name is also recorded as Athenia either by mistake or prior to a change in registration. The ship was sold to owners in Bremen, Germany-probably because of the Civil War. She seems to have had a long service until at least 1875, but her eventual end is unknown. Under the command of Captain Henry C. Dearborn the American packet ship B. S. Kimball sailed from Liverpool for the New World on 8 May 1863. On board were 657 Mormons, principally from Scandinavia. President George Q. Cannon of the European Mission organized the company. He appointed Elder Hans Peter Lund to preside over the emigrants, assisted by Elders Peter Beckstrom and Christoffer S. Winge as counselors and P. Wilhelm Poulsen as clerk. The emigrants were also divided into seven districts, each with a president and captain of the guard. Among the passengers was Lise Christiansen, a young Danish girl whose descendants would include two general authorities of the church. Her recollection of the passage was unpleasant and at times frightening. During the voyage there were four deaths, two births, and eleven marriages. The vessel anchored in New York harbor Saturday evening, 13 June, but the passengers did not land until two days later-thirty-eight days after leaving England. Two years later to the day-8 May 1865-Captain Dearborn sailed the B. S. Kimball from Hamburg with 558 Saints aboard. Most of the emigrants again were from Scandinavia. The company was directed by Elder Anders W. Winberg, his counselors John Swensen and Hans C. Hogsted. The voyage was tragic, measles and scarlet fever breaking out at sea. Three adults and twenty-five children died, one of the highest death tolls of an emigrant company. After a thirty-seven-day passage the ship arrived at New York on 14 June. The B. S. Kimball was owned by David B. and George A. Dearborn of New York City and John E. Donnell of Portland, Maine. She was built with two decks, a square stern, and a figurehead. Apparently this three-masted vessel was modified slightly, for her breadth was later increased to 39 feet and depth to 25 feet. Tonnage in 1865 was increased to 1285 tons by a somewhat different calculation. In her early years the ship ran in the Regular Line in the New Orleans trade. In 1868 her registration was canceled, because the vessel was lost. This small Norwegian bark, under the command of Captain A. Foyen, sailed from Hamburg on 1 June 1866 for America. On board were 201 Scandinavian Mormons under the presidency of Elder Niels Nielsen, a returning missionary, and his assistants, Jens Gregorsen and Carl F. Rundquist. During the sixty-day passage cholera broke out among the emigrants, first appearing in the L. Larsen family. At sea two elderly women and two children died; however, after arrival at New York on 31 July, many others died, particularly during the rail journey to St. Joseph, Missouri. The Cavour was owned by M. Tonning and Captain Foyen, both of Langesund, Norway. She was the only known Norwegian flag vessel that crossed the Atlantic carrying a Mormon emigrant company. Her eventual fate is obscure. Departing Liverpool on 8 May 1863, the three-masted Consignment carried thirty-eight Scandinavian Saints across the Atlantic. The emigrants were in the charge of returning missionary Anders Christensen. After a "successful" voyage of forty-three days the ship arrived at New York on 20 June. Master of the vessel was a Captain Tukey, about whom little is known. This square-rigger's home port was originally Brunswick, Maine, and then later New York City in the 1860s. She was apparently owned by Walsh, Carver, and Company about the time of this passage. She was built of oak and hackmatack with copper and iron fastenings and metalled in 1860. The vessel had two decks, no galleries, a square stern, and a billethead. For several years, she operated in the Regular Line and Warren & Thayer's Line. After 1864 her fate is unknown. Flying a German flag, the clipper ship Electric sailed from Hamburg on 18 April 1862. Aboard were 336 emigrating Mormons from Denmark and Sweden led by Elder Soren Christofferson. Under his direction the Saints were divided into nine districts. The Electric, commanded by Captain H. Johansen, was one of four German ships that departed from Hamburg in April 1862 with Mormon emigrants, the other three being the Humboldt, the Franklin, and the Athena. The Electric sailed down the Elbe to Gluckstadt Roads where she anchored near the ship Athena with her company of 484 Saints. The Electric continued her voyage and again anchored off the coast of Hanover until the winds changed. On 25 April the winds carried the ship into the North Sea toward America. During the voyage meetings were held on shipboard, and "union and harmony existed among the emigrants." After a forty-eight-day passage, during which there were at least ten deaths, one birth (a girl who was named Sophia Electric Sorensen), and a marriage, the vessel arrived at New York on 5 June. The Electric was one of the famous clipper ships built in America. About 1860 she was sold to R. M. Sloman & Edye of Hamburg, perhaps as a result of the Civil War. This three-master made one passage around Cape Horn to San Francisco in 109 days from New York in 1854-55-a relatively fast time. In 1868 she went ashore at Great Egg Harbor, New Jersey, but extensive repairs restored her to service. In November 1872 she was abandoned in the Atlantic in a sinking condition. 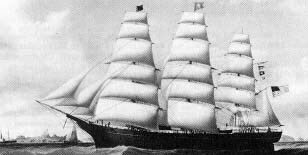 A famous clipper packet, the full-rigged Emerald Isle carried a total of 1280 Mormons in three voyages across the Atlantic Ocean. The first passage began on 30 November 1855 at Liverpool with 350 Saints on board. Elder Philemon C. Merrill and his counselors, Elders Joseph France and Thomas B. H. Stenhouse, presided over the emigrant company. Captain George B. Cornish, a veteran mariner, commanded the vessel. In 1848 he was listed as master of the 895-ton ship Sheridan. The crossing was marked by some damage caused by high winds and heavy seas, the deaths of two children, and three marriages. After a relatively fast crossing of twenty-nine days the ship arrived on 29 December at New York harbor. Almost four years later, on 20 August 1859, the Emerald Isle again skippered by Captain Cornish sailed out of Liverpool with fifty-four Saints aboard-fifty from Switzerland and Italy and four from England. Elder Henry Hug was in charge of the company. After a forty-two-day passage, of which there are no details, the vessel arrived on 1 October at New York. This same ship began her third voyage with Mormon emigrants on 20 June 1868 at Liverpool. There were 876 Saints in the company, of which 627 were from Scandinavia and the rest from the British Isles. Elder Hans Jensen Hals presided over the company. His counselors were Elders James Smith and John Fagerberg. On this crossing the ship was commanded by a Captain Gillespie. After six days the square-rigger put into Queenstown harbor to take on fresh water, since the equipment to distill sea water for culinary use had broken down. On 29 June the voyage resumed, but life on shipboard became increasingly unpleasant. The officers and crew treated the Saints harshly, and Elder Hals protested to the captain and reminded him of the contractual and legal rights of the passengers. On one occasion a mate attacked a Sister Saunders, and a "Brother Jensen" pulled the mate away and chastised him. Soon a group of sailors threatened violence but were subdued after the master reprimanded the offender. According to the Church Emigration record, no other emigrating company was known to have received such bad treatment. "Fortunately this is the last company of Scandinavian Saints which crossed the Atlantic Ocean in a sailing vessel." However, it was not just the treatment from the ship's of officers and crew that created unpleasantness, but the water became stagnant and unfit for use, causing much sickness among the emigrants. No less than thirty- seven deaths occurred. Although many children died of measles, it was felt that the drinking water contributed to the high death rate. During the three days of quarantine in the New York harbor thirty-eight sick emigrants were taken ashore. On 14 August-after a fifty-five-day passage-the Saints landed at Castle Garden. 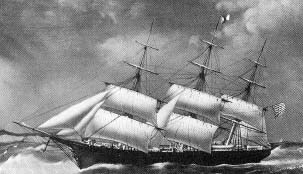 Described by her owners-Tapscott's Line-as a half clipper in model and a packet clipper in rig, the Emerald Isle hailed out of New York and was the largest vessel built at Bath, Maine, until the 1860s. She was somewhat full bodied, sharp, and heavily sparred. She was a three-decker but also had a forecastle deck with two large houses for a galley, storerooms, and crew's quarters and a small cabin abaft the main hatch. The first lower deck contained a steerage cabin with a double tier of staterooms on each side running forward to the main hatch. Each of these staterooms had eight berths. This graceful ship had a figurehead of a dog in the act of leaping. Her stern was half round with a carved moulding which had the Harp of Erin in the center, an American Eagle on the right, and a dog on the left. Underneath were written the mottoes on the Irish and American coat of arms-Erin-go-Bragh and E Pluribus Unum. The Emerald Isle was among the first vessels to have standing rigging of wire. In 1885 she was sailing under the Dutch flag and renamed Berendina Oriria out of Batavia. Mormon emigrants from Denmark, Sweden, and Norway-the first large Scandinavian company-assembled at Liverpool and on New Year's Day 1853 boarded the Canadian-built packet ship Forest Monarch . However, storms and contrary winds kept the vessel anchored in the River Mersey for more than two weeks. During that time three children died, two babies were born, three passengers were converted and baptized, and some emigrants were injured when a nearby craft broke loose from her moorings and drifted into the Forest Monarch. Finally on 16 January 1853 the Scandinavians sailed out of the estuary and were on their way to America. There were now 297 Saints among the passengers. Elder John E. Forsgren presided over the company. Two years earlier he had opened the Scandinavian Mission with Apostle Erastus Snow. Forsgren's shipboard counselors were Elders Christian Christiansen and J. H. Christensen. During the voyage the weather was generally pleasant, although the ship was becalmed for several days. Provisions were poor, and fresh water was exhausted before reaching port. Four deaths were recorded, and three children were born during the crossing. After a fifty-nine day passage the ship arrived at New Orleans on 16 March, but several days earlier at the mouth of the Mississippi five more emigrants died. This British square-rigger was skippered by Captain Edmund Brewer and hailed out of Liverpool. The Forest Monarch was carver-built with three masts, one deck, a round stern, a standing bowsprit, and a figurehead of a man. Her owners had been Pierre Valin of Quebec, her builder, and De Novo at Liverpool. The vessel was not listed in Lloyd's Register after 1854. The passengers had boarded the Franklin on the evening of 8 April. Below deck l they found 160 bunks which were wide enough for three persons to lie side by side. Their rations consisted of beef, pork, peas, beans, potatoes, pearl barley, rice, prunes, syrup, vinegar, pepper, coffee, tea, sugar, butter, rye bread, sea biscuits, water, flour, I salted herring, salt, and lamp oil. There were eleven lanterns, six belonging to the ship and five to the emigrants. For 90 rigsdaler, the Saints hired an extra cook in Hamburg, who was assisted by two of "our brethren." On Sunday the cooks served "sweet soup;" Monday, pea soup; Tuesday and Wednesday, rice; Friday, barley mush; and Saturday, herring and potatoes. Some of the emigrants carried the measles with them from home and the disease soon spread to all parts of the ship, so that no less than forty persons, mostly children, were attacked at once. Many of the emigrants were also suffering with diarrhea, which caused much weakness of body. We lost the appetite for sea biscuits, but reamed to soak them in water or tea for eight to ten hours, which softened them so that they became more palatable. The sick were served twice a day with porridge made from barley, rice or sago, and almost every day pancakes could be had by the hundreds for the sick, who could not eat the "hardtack" (sea biscuits). Wheat bread was also baked for some of the old people. We held a council meeting every night and the sanitary condition of the ship's apartments were attended to with great care. Three times a week the decks were washed and twice a week the ship was thoroughly fumigated by burning tar. A spirit of peace prevailed.... The captain and crew were good-natured and obliging and so were the cooks who even served the sick when they were not on duty. We held at times meetings of worship on the upper or lower deck, and every morning at 5 o'clock the signal for rising was given by the clarionet or accordion. At 7 a.m. and 9 p.m. a similar signal was sounded calling the Saints to assemble in their several districts for prayer. Most every day we amused ourselves a short time by dancing on deck to music played by some of our brethren or members of the crew. We could thus have had an enjoyable time, had it not been for the sorrow occasioned by the many sick and dying amongst us on account of the measles. Up to this date (May 27th) three adults and 43 children have died, nearly all from measles. During the last few days, the chicken-pox has broken out amongst us and four cases have already developed. We have had head winds most of the time; otherwise we could have been in New York before now for the "Franklin" is a first-class ship. We have been very little troubled with seasickness. By the time the Saints arrived at New York forty-eight had died-more than 11 per cent of the company. At Castle Garden the Saints were quarantined. After eighteen had been hospitalized, the remaining emigrants were returned to the Franklin. They remained on shipboard two more days and a night. On 31 May they were received at Castle Garden, where Elder Charles C. Rich and other church representatives greeted them. However, before the company reached Utah there were fourteen more deaths, bringing the total to sixty-two since leaving Hamburg. It is almost certain that the Franklin was formerly the American ship Yankee Ranger which was sold to German owners at Bremen in 1858. Both vessels were registered at 708 tons and reportedly built at Roclcland, Maine, in 1854. The Franklin was rigged as a bark and ship at different times, not an unusual practice for this type of sailing craft. She was a three-master with two decks, no galleries, a round stern, and a figurehead. In 1866 she was reported sold to Norwegian owners. 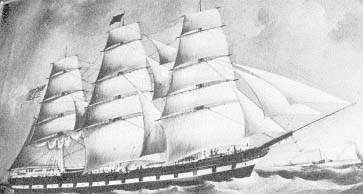 A German ship, the Humboldt carried two companies of Scandinavian Mormons to America. In each case, the emigrants assembled at Hamburg and from that port embarked on this square-rigger. Shipmaster was Captain H. D. Boysen, who commanded the vessel from 1858 to 1866. The first company of 323 Saints departed on 9 April 1862 under the leadership of Elder Hans Christian Hansen, a returning missionary. The voyage was described as successful, although fourteen died at sea and on the land journey to Florence, Nebraska. The ocean crossing to New York required forty-one days before the ship] docked on 20 May. The food on the boat consisted of soup, potatoes, beans, fish, bread, or hardtack biscuits. The cooking was done in iron pots so large the cook could get inside. No bread was made on the ship, the biscuits having been made months before and were extremely hard and dry. The potatoes were sour and soggy. The drinking water was taken from the River Elbe, in Germany, put in wooden barrels, that had been burned on the inside, and was as black as coal, when we drank it. Water was also put in large iron barrels, holding about five hundred gallons, and when the water from the wooden barrels was exhausted, the water from the iron barrels was used. This was red with rust. Pigs would object to the food and water but had to take it. The beds on the ship were made of common lumber, with room for four in width and were two tiers high.... We had good trip except for fog as we neared the Newfoundland Coast, where another sailing vessel ran into us causing slight damage to our ship. When we were in mid-ocean, I did a boyish prank. Outside under the bow of the vessel, where anchor and chains are hung, I ventured out unknown to my parents or anyone else, I sat there for some time and I was able to see beneath a part of the vessel as the boat plowed through the ocean. This was a very dangerous thing for me to do. Had I slipped and fallen into the ocean, no one would have known what had become of me. But I climbed back safely. We were six weeks crossing the Atlantic Ocean and were glad when we reached Castle Garden, New York, where we stayed for three days. We all had to pass a doctor's inspection before landing. Shortly after this voyage-possibly on her return trip the Humboldt was lost. The vessel was owned at this time by Robert M. Slomann of Hamburg. Her sailing life was thirteen years before her end in 1866. In 1852 the Italy took 28 Danish emigrants to America. Twenty-eight Saints under the leadership of Ole U. C. Monster-the first emigrants from the Scandinavian Mission sailed from Liverpool aboard the ship Italy on 11 March 1852. Among these converts were the Rasmus Petersen family, the Edward Schvaneveldt family, the Niels Jensen family, the Christian Raven family, William Knudsen, Nils Olsen, Hans Hansen, Frederik Petersen, Ferdinand F. Hansen, Carl Jorgensen, Bertha S. Hansen, Augustus Dorius, Cecilia Jörgensen, and Johanne Andersen. Shipmaster was Captain John Q. A. Reed (or Reid). After sixty days on the water, during which two infants died, the passengers landed at New Orleans on 10 May. The Italy was owned by G. F. and J. Patten. Her home port was Bath, Maine. On 3 February 1853 she was found "abandoned at sea." On 7 January 1855 a company of 440 Scandinavian Saints-about 300 of which had survived a particularly stormy voyage from Copenhagen to England aboard the steamer Cimbria-sailed from Liverpool in the ship James Nesmith. Elder Peter O. Hansen presided over the emigrants. Captain Harvey Mills skippered the vessel. This master had previously commanded the 200-ton brig Thomas & Edward in 1846 for the Dispatch Line and the 199-ton brig Ellis in 1847 for the New Line. The passenger manifest listed thirteen deaths during the crossing. On 23 February the square-rigger arrived at New Orleans after a forty-seven-day passage. Eight of the thirteen owners of this ship were from Thomaston-"The Town of a Hundred Captains." These owners included two members of the noted seafaring Watts family, Captain Mills from St. George, Maine, and James Nesmith of New York, for whom the vessel was named. This three-master had two decks, no galleries, a square stem, a billethead, and hailed out of New York. In 1864 she was sold to foreigners. 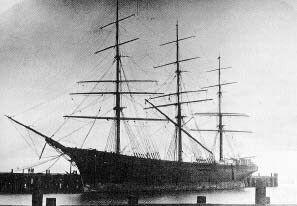 On 3 January 1854 a company of 335 Scandinavian and German Latter-day Saints sailed from Liverpool aboard the chartered square-rigger Jessie Munn, one of many Canadian-built vessels sold to English owners. Elder Christian Larsen presided over the emigrants, and Captain John Duckitt commanded the ship. After a "prosperous" voyage, during which ten children and two adults died and three couples were married, the vessel arrived at New Orleans on 20 February-a passage of forty-eight days. The ship's name has been spelled "Jesse Munn" and "Jessie Munn" in different sources; however, the Liverpool registration and Lloyd's Register record the latter spelling. This three-master had one deck and a poop deck, a square stern, and a figurehead of a woman's bust. Principal owners of the ship were H. T. Wilson and John Duckitt, her master. In 1868 the Jessie Munn was abandoned at St. Peter's Bank. Three voyages the full-rigged John Bright of New York made with Mormon emigrants. The first began at Liverpool on 22 March 1858. The ship was commanded by Captain R. C. Cutting, and among the passengers were eighty- nine Mormons eighty from Scandinavia and nine from England. Elder Iver N. Iversen, returning home from a Scandinavian mission, was in charge of the Saints. After a thirty-two-day passage, during which a young Danish woman and a child died, the emigrants reached New York on 23 April. The second voyage originated at Liverpool on 30 April 1866. Captain W. L. Dawson was master of the ship. Aboard were some 747 Mormon emigrants led by Elder Collins M. Gillet, a returning missionary from England, who died that August crossing the plains west of Fort Kearney. He was assisted by Benjamin J. Stringham and Stephen W. Alley. Among the emigrants was a young boy, Brigham Henry Roberts, who was to become a prominent writer and leader in the LDS Church. During a "pleasant" passage of thirty-seven days there were no deaths and only one storm. Three births and one marriage were recorded. The vessel docked at New York on 6 June. On 4 June 1868, the John Bright sailed from Liverpool with a company of 720 Saints, of whom 176 were from Scandinavia and the remainder from the British Isles. These Saints were described "in fine spirits being full of joy at being on their way to Zion." Captain John Howart was master of the vessel. Before departure President Franklin D. Richards called all the emigrants on deck and outlined their duties and responsibilities. He emphasized cleanliness, order, unity, harmony and good feelings, obedience to counsel, and "kindness and assistance to the aged, sick and infirm." At this meeting Elder James McGaw was appointed president of the company, with Elders Christopher O. Folkmann and Frederick C. Andersen as counselors. Charles W. Penrose, who would later become an apostle and member of the First Presidency, dedicated the vessel. It had been planned that this company would cross the Atlantic by steamer, but the cost was prohibitive at that time. The voyage was uneventful, and there was little seasickness. One aged and ailing woman died during the passage, and one couple was married. Captain Howart was "very kind and obliging towards the Saints." The ship arrived at New York on 13 July, a passage of thirty-nine days. This American three-decker, one of the largest square-riggers used by the Saints, was chartered by the church for this voyage from Williams & Guion. She had an elliptic stern, a round tuck, and a billethead. In 1874 she was wrecked off the coast of Brazil. Nearly two thousand Latter-day Saints were transported to America in three voyages by the full-bodied ship John J. Boyd of New York. Her first voyage began at Liverpool on 12 December 1855, just a few months after she was launched. On board were between 508 and 512 Mormon emigrants from Denmark, Norway, Sweden, Iceland, Italy, England, Ireland, and Scotland. Elder Knud Peterson presided over the Saints. The shipmaster was Captain Thomas Austin. He had previously skippered the 1418-ton ship Jacob A. Westervelt and the 1448-ton ship Cultivator. It was a well-ordered company. Rules of cleanliness and conduct were established. A trumpet called the emigrants to prayer morning and evening, and religious services were held frequently in the English, Danish, and Italian languages. Our captain got superstitious on account of the long passage, and ordered that there should be no singing on board; the mate said that all ships that had preachers on board were always sure of a bad passage; however, the Lord heard our prayers, and in His own due time we arrived at our destination. On the evening of the 15th of February we were safely at anchor-having been 66 days out from Liverpool.... On our taking the pilot, he informed us that there had been many disasters during the months of January and February; many ships had been wrecked. We made the passage without the loss of a single spar. On 16 February the emigrants landed at New York. Under the command of Captain J. H. Thomas, her master since 1857, the John J. Boyd sailed from Liverpool on 23 April 1862 with 702 Latter-day Saints aboard. Apostles Charles C. Rich, Amasa M. Lyman, and George Q. Cannon organized the company and appointed Elders James S. Brown as president and John Lindsay and Joseph C. Rich as his counselors. There were also five other returning missionaries besides the presidency. After a thirty-nine-day voyage, which though successful was somewhat longer than usual because of head winds, the Saints landed on 1 June at New York. On 30 April 1863 the John J. Boyd with 767 Mormons aboard sailed from Liverpool again under the command of Captain J. H. Thomas. Elder William W. Cluff presided over the Saints, assisted by Elders Knud H. Bruun and William S. Baxter-three of nine returning missionaries. Most of the emigrants were from Denmark, Norway, and Sweden. During the twenty-nine-day voyage sanitation and food were commendable. The emigrants sighted a number of icebergs and whales. The vessel arrived at New York on 29 May. Named for an early marine merchant, the John J. Boyd was owned by William Tyson of New York. She was a three- decker with a square stern, round tuck, and billethead. Apparently in 1860 this packet ship was damaged by fire and salvaged. In July 1863, probably because of the Civil War, the vessel was sold to foreign owners. Originally built in America as the Volant, the ship was transferred to British registry in 1864 and renamed Kenilworth. In 1866 her owner was David Jones of Swansea. She was a two-decker with a square stern and a billethead. On 27 August 1877 the Kenilworth was lost in the Strait of Belle Isle. Six emigrant companies-totaling 1308 Saints-crossed the Atlantic aboard the steamer Manhattan of the Guion Line. These companies ranged in size from 35 to 482, and the passages from Liverpool to New York averaged 14.7 days. The first voyage began on 21 June 1867, and the last on 4 December 1872. Captain James Williams skippered the first crossing, Captain William Forsyth the next three, and Captain James Price the last two. Among the prominent Mormons who traveled aboard this ship were Dr. Karl G. Maeser, a prominent Utah educator, and Lorin Farr, mayor of Ogden, Utah, for many years. Hailing out of Liverpool, the Manhattan was a sharp model with three decks, an iron hull, inverted engines, two masts, one funnel, a clipper bow, and a speed of 10 knots. She accommodated 72 first and 800 third-class passengers. In 1875 she was sold to the Warren Line for its Liverpool to Boston service and renamed Massachusetts. On 15 August 1902, after several changes of name and ownership, the vessel was wrecked near Cape Town, South Africa. Her sister ships were the Chicago, Colorado, and Minnesota. Of the Mormon companies crossing the water under sail, the two largest were transported over the Atlantic in the largest sailing ship used by the Saints-the Monarch of the Sea. According to one of these passengers, she was "an excellent vessel, large, roomy, new and clean." The 1929 Mormons in the two companies were an assembly of nations, coming from England, Wales, Ireland, Scotland, Denmark, Sweden, Norway, France, and Switzerland. The first company, consisting of 955 Saints, sailed from Liverpool on 16 May 1861. Elder Jabez Woodard presided over the passengers, which included some returning missionaries. His counselors were Elders Hans O. Hansen and Niels Wilhelmsen. Captain William R. Gardner of Providence, Rhode Island, commanded the ship. An experienced mariner, he apparently was master of the 934-ton ship Huguenot in 1849 for the New Line. During the passage the Saints were organized into eleven wards and lived together harmoniously. There were eleven weddings, nine deaths, and four births on shipboard. After thirty-four days at sea the Monarch of the Sea dropped anchor on 19 June at New York. The second company, totaling 974 Saints, sailed from Liverpool on 28 April 1864. Elder John Smith, patriarch to the church, was in charge of the emigrants. His counselors were Elders John D. Chase, Johan P. R. Johansen, and Parley P. Pratt, Jr. Master of the packet was Captain Robert Kirkaldy. This company also represented many nations, particularly Scandinavia. Although the voyage of thirty-six days was quite pleasant, the death toll was unusually high-forty-five according to George Q. Cannon and forty-one according to the passenger list. Most of those who died were apparently children. The ship arrived at New York on 3 June. A big three-decker, this clipper ship was exceptionally strong and fast and operated in the Washington Line out of New York. Built with the usual three masts, a round stern, and billethead, she was owned by Captain William R. Gardner and other businessmen. After more than a quarter of a century in service the Monarch of the Sea was reported lost in 1880. 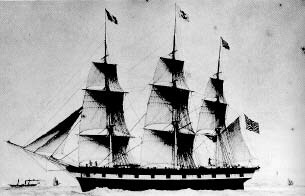 A Mormon emigrant company that in a few months would encounter much hardship and tragedy sailed from Liverpool for America in the large square-rigged Thornton on 4 May 1856. Presiding over the 764 Saints on board was Elder James G. Willie. He was assisted by Elders Millen Atwood, Jacob Amanion, and Moses Clough. This chartered vessel was commanded by her part-owner, Captain Charles Collins. After a forty-one-day passage the Thornton arrived at New York City on 14 June. From there the Saints traveled by rail to Iowa City, and about five hundred of the emigrants organized a handcart company. However, their trek to Great Salt Lake City started late in the season and was marked by suffering and disaster. Over sixty Saints died on the historic journey, and the remainder arrived in a pitiful condition. The three-masted Thornton was built with three decks, a square stern, and a billethead. She was owned by Williams & Guion of New York City and in 1858 was listed in the Warren & Thayer Line. This ship traded in the Atlantic until she was lost at sea in 1869. Captain Richard M. Dunlevy sailed the square-rigged Tuscarora out of Liverpool on 30 May 1857. On board were 547 Latter-day Saints, of whom 298 were from Scandinavia and the remainder from Great Britain. Elder Richard Harper and his counselors, Joseph Stapleton and C. M. Funck, presided over the company. After a pleasant thirty-four-day voyage the ship arrived on 3 July at Philadelphia. The Tuscarora was owned by the Cope Line of Philadelphia. She was built with three masts, three decks, a square stern, and a billethead. About 1873 the vessel was lost at sea. 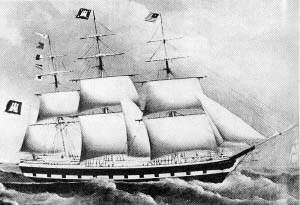 With 544 Latter-day Saint passengers, the full-rigged Westmoreland of Philadelphia sailed from Liverpool on 25 April 1857. Of this company 540 were from Scandinavia, and four missionaries were returning from Great Britain: Elders Matthias Cowley, Lorenzo D. Judd, Henry Lunt, and George W. Thurston. Elder Cowley presided over the emigrants with Henry Lunt and Ola N. Liljenquist as his counselors. Among the emigrants was C. C. A. Christensen, the famous Mormon painter. Master of the vessel was Captain Robert R. Decan. He had considerable experience at sea. before assuming command of the Westmoreland in 1854. For example, in 1848 he skippered the 339-ton bark Sultana; in 1849, the 624-ton ship Champlain; in 1851, the 738-ton ship Shenandoah; and in 1852, the 816-ton ship Saranak. Most of the vessels ran out of Philadelphia. The crossing was one of harmony and good feeling among the emigrants. During the voyage an old man and two small children died. Five couples were married, and a baby was born and appropriately named for the master and ship-Decan Westmoreland Goff.After a thirty-six day passage the emigrants landed at Philadelphia on 31 May. The Westmoreland was owned by John Burton and John R. Penrose of Philadelphia. She was a two-decker with three masts, a square stern, a figurehead, and was built of oak with iron and copper fastenings. In 1873 the vessel was wrecked by fire and sold at auction. In three voyages the square-rigger William Tapscott transported 2262 Mormon emigrants-the greatest number of any sailing craft. Captain James B. Bell was master during these passages. The first began at Liverpool on 11 April 1859. Under the presidency of Elder Robert F. Neslen and his counselors, Henry H. Harris and George Rowley, the 725 Saints were organized into five English and Swiss wards occupying one side of the ship and five Scandinavian wards the other side. Each ward had a presiding elder responsible for cleanliness and good order. Despite the fact that nine languages were spoken, there were harmonious feelings and unity among the Saints. It was a pleasant and successful voyage. Morning and evening prayers were held, as well as regular religious services. Entertainment consisted of singing, instrumental music, games, and dancing. There was only one death, but two births and nineteen weddings were recorded. After a thirty-three-day passage the emigrants landed at New York on 14 May. The following year---11 May 1860 the William Tapscott sailed from Liverpool with 730 Saints from Britain, Scandinavia, and Switzerland on board. Elder Asa Calkin presided over the company. His counselors were Elders William Budge and Carl Widerborg. The voyage was stormy and unpleasant, and adding to the distress smallpox broke out among the Scandinavian Saints. During the thirty-five-day passage there were ten deaths, four births, and nine marriages. When the vessel arrived at the quarantine point in the New York harbor on 15 June, physicians came aboard and vaccinated most of the passengers and crew. It was not until 20 June that the emigrants were permitted ashore. The third and largest company of 807 Saints sailed from Liverpool on 14 May 1862. Prior to the vessel's departure Apostles Amasa M. Lyman, Charles C. Rich, and George Q. Cannon came aboard and organized the company. Elder William Gibson was appointed president, and his counselors were Elders John Clark and Francis M. Lyman. The Saints were then divided into nineteen wards, and during the voyage prayers were held morning and evening. After a successful forty-two-day passage the ship reached New York on 25 June. 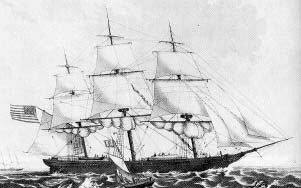 The William Tapscott was one of the largest full-rigged ships built in Maine during the 1850s. She was a typical "Down Easter"-sturdy, moneymaking, moderately sparred, and designed for carrying capacity. She was a three- decker with a square stem and billethead. Among her owners, including her namesake, were such well-known mariners as William Drummond, Gilbert C. Trufant, and George B. Cornish. She hailed from New York. After plying the oceans for about forty years the William Tapscott was lost in the English Channel in the early 1890s.